My daughter Andie developed a recipe for this amazing, creamy, hearty soup! 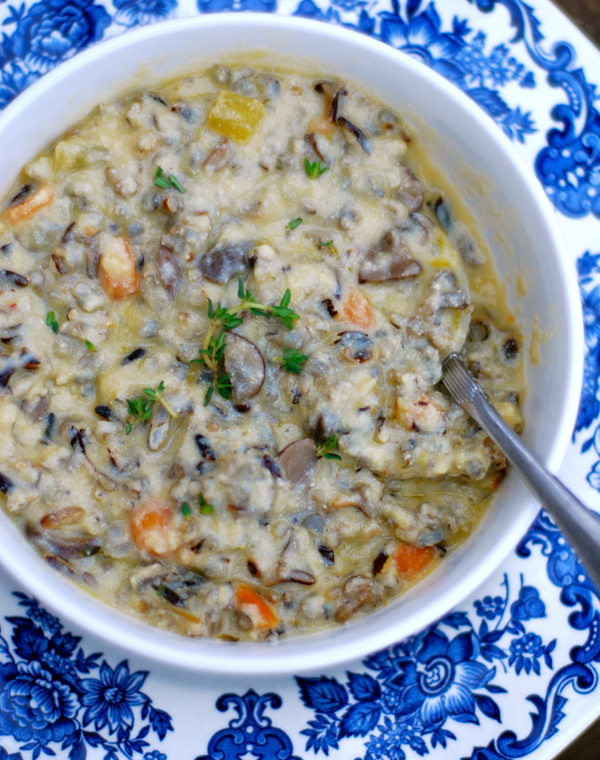 Before going vegan, one of our favorite winter soups was creamy chicken and wild rice. This is even better, and you won’t miss the chicken even one little bit! Make cashew cream and refrigerate until needed. Make the wild rice according to package directions. Cover and set aside, until needed. Start the soup: Place a big, heavy-bottomed soup pot over medium heat. Add a splash of veggie stock OR 1 Tablespoon olive oil. Once hot, add onions and saute until tender. Add red pepper, carrots, celery, and bay leaves. Cook until veggies are slightly golden and tender. Add garlic and cook an additional 30 seconds, just until fragrant. Add mushrooms. Stir. Allow mushrooms to cook until they release their juices and then reabsorb them. Stir in onion powder and wine. Stir until liquid has been absorbed. Add stock and boullion base. Bring to boil and then reduce heat to a gentle simmer. Cover pot, with lid slightly askew, while you prepare the roux. Make roux: Add 1/4 cup vegan butter to a small saucepan. Cook over medium heat until melted. Whisking constantly, slowly add flour. Stir for one minute, and then add a little veggie stock until roux resembles thick gravy. Cook an additional minute, whisking constantly to prevent clumps from forming. Add roux to simmering soup and stir until thickened. Add cashew cream and rice. Stir. Taste and adjust seasonings as necessary. Thin with additional veggie stock if needed. Cook just until heated through. Remove from heat and ladle into bowls. Garnish each serving with a sprig of fresh thyme, if you wish. Drain cashews and place them in the bowl of a blender (not a food processor) along with lemon juice and stock/liquid. Pulse and scrape down sides of blender until cashew cream is very smooth. Hi, Melissa, and thank you for this recipe! I have a sweet vegetarian friend for whom I am always looking for delicious recipes to prepare when she comes for dinner! With the colder weather, I’d love to make this for her. The directions call for adding wine with the onion powder, but the ingredients list doesn’t list wine. Would you please advise? Sorry I missed it when I wrote the recipe. You add 1/2 cup of dry white wine.